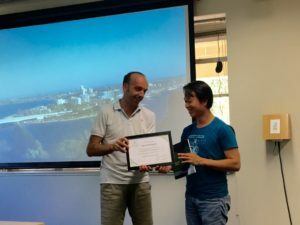 Dr Nghia Nguyen, a lecturer from Cantho University in Vietnam, was identified as a young research leader and invited to participate in training at the Australian Herbicide Resistance Initiative at the University of Western Australia (UWA). He trained for a period of two months under the supervision of Dr Roberto Busi and Professor Stephen Powles. Dr Nghia is currently the Vietnamese research coordinator in a joint research endeavour between UWA, Cantho University (Vietnam) and PhilRice (Philippines). This research is funded by ACIAR and focuses on the control of weedy rice in South East Asia. Dr Nghia’s visit focused on this specific research project, as well as activities to build up skills related to weed science in general. 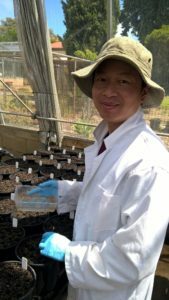 The activities undertaken at UWA were designed to help Dr Nghia learn specific methodologies including conducting geographical surveys, seed germination tests, herbicide efficacy tests and herbicide dose-response statistical analyses. “In this training I have learnt many things, especially use of innovative herbicide solutions for weedy rice control, and some strategies that can help formulate long-term management measures to sustain rice production in Vietnam and more broadly Asia,” said Dr Nghia, pictured right. This improved knowledge will help Dr Nghia, via extension centres in the Mekong Delta, to raise awareness for rice farmers and local agronomists in Vietnam about the damaging effects of weedy rice, the threat of herbicide resistance in rice weeds and illustrate options for effective weed control in rice. “Farmers in Vietnam will not be suffering anymore from weedy rice in their rice farms. We will have a sustainable rice production in Vietnam by innovative herbicide solutions for weedy rice control and some areas of rice farms which have declined as a result of infestation of weedy rice will improve in terms of yield,” he said. The training undertaken at UWA allowed Dr Nghia to build up fundamental knowledge in weed science research principles, which will provide common ground to foster future collaborations between UWA and Cantho University. These collaborations will focus on sustainable rice production systems in Asia, novel technologies for weedy rice and weed control, and integrated management strategies. An important result of the research conducted by Dr Nghia at UWA is a manuscript entitled ‘An innovative method to manage weedy rice in global rice crops’, which is in preparation to be submitted to a relevant peer-reviewed journal.